As with every new product launch, Apple's online store went down for maintenance ahead of Friday's iPhone 7 preorder kickoff. 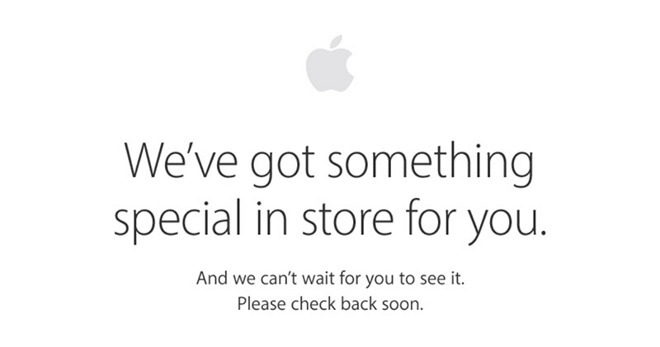 Apple has updated its familiar downtime landing page with a message in bold typeface reading, "We've got something special in store for you." Apple's iPhone 7 and 7 Plus will go up for preorder in just a few hours, bringing with it a slew of performance improvements and all-new features. Chief among hardware changes are upgraded camera modules, including a dual-camera system on iPhone 7 Plus that provides users with a high-quality 2X optical zoom system. Other enhancements include an A10 Fusion processor thought to outperform all previous A-series SoCs, a solid-state home button, more onboard storage, water-resistant design, two new black color options and more. It also lacks a headphone jack in favor of Lightning and wireless audio solutions, the latter of which will debut as AirPods next month. The 4.7-inch iPhone 7 starts at $649 for 32 GB of storage, and moves up in price to $749 for 128 GB and $849 for 256 GB. The 5.5-inch iPhone 7 Plus will be available for $769 for 32 GB, $869 for 128 GB and $969 for 256 GB. As for Apple Watch Series 2, Apple's updated wearable gets a long-awaited GPS radio, faster dual-core processor, brighter screen, swim-proof housing and an all-new ceramic casing option. A special Nike+ model for runners is also up for preorder, though the version is set to debut in October. Apple Watch Series 2 starts at $369 for all 38mm aluminum versions, while 42mm models come in at $399. Stainless steel and Space Black stainless steel Apple Watch Series 2 models start at $549 for the 38mm version with sport band, or $599 for 42mm. The white ceramic edition comes in at $1,249 for the 38mm case, while the 42mm version is set at $1,299. In preparation of tomorrow's preorder bonanza, AppleInsider created a handy preorder guides for iPhone 7 and Apple Watch Series 2 to make sure buyers are ready when Apple's system goes live at 12:01 a.m. Pacific.